CGU launches serious business cover for tradies. The north Queensland strata title market is paying the price for years of undervalued premiums. 14 The rise and rise of the number-crunchers » Estelle Pearson sees a golden age ahead for the industry’s increasingly influential actuaries. 20 When two worlds collide » Owning capacity and distribution is a growing trend in insurance markets around the world – and Australia is no exception. QUS does a deal with WR Berkley, and everyone’s happy. 60 It really could happen » If it does, you’d better have ticked ‘management liability for SMEs’ in the Vero bizpak. 60 Striking a deal » SUA launches a general liability product and buys a niche underwriter. 60 Cyber serious » Chartis develops a product to help companies deal with attacks and data loss. 22 Get that name right » …and then design a logo that backs it up. An expert shares some insights into the art of corporate branding. 26 The top 20 most influential people in insurance » Our annual round-up of the people who change people’s minds, affect the industry and make things happen. 38 Modelling uncertainty » They’re not perfect – yet – but catastrophe models do empower insurers to manage risks, says AIR Worldwide’s Ming Lee. 44 Socially speaking » Insurers have embraced social media, where customers set the rules and some things go inexplicably viral. 48 The long arm of Lloyd’s » The market’s pursuit of a former Name lasted over 10 years, ending up in New Zealand. 50 Winners and losers » Who’s to blame? Two governments avoid damaging legal judgements over bushfires. 54 Call for action » Sydney’s flood-prone northwest has featured in a major NSW study. 56 Freight angels » From crash site cowboys to recovery professionals in just 10 years. How NTI’s Accident Assist revolutionised the heavy vehicle industry. Fire risk rising: Fire risk has risen across Australia over the past four decades, particularly in the south and southeast, in a clear example of man-made climate change, according to one of the world’s foremost climate experts. A New South Wales report studying changes in Australia’s “fire weather” – conditions that are likely to lead to a fire outbreak – between 1973 and 2010 has found an upward risk trend across most of Australia, and a particularly strong trend in South Australia, western NSW, Victoria and northern Tasmania. Melbourne and Adelaide recorded 49% increases in their cumulative annual Forest Fire Danger Index, a scale used to quantify fire weather conditions by state agencies to announce fire warnings. Professor David Karoly, lead author for the Intergovernmental Panel on Climate Change and a Professor of Climate Science at Melbourne University, says while the report doesn’t link rising fire risk with climate change, its findings are consistent with other papers that demonstrate a connection. He says that as the La Nina weather pattern dissipates, marked by above average rainfall, fire risk would likely rise over the next few years. The Australasian Institute of Chartered Loss Adjusters (AICLA) has elected a new board, with Tasmanian adjuster Michael Cooke being named the new president. The institute’s annual general meeting also elected Stephen Kwang of Singapore as Deputy Chairman. Chief Executive Tony Libke told insuranceNEWS.com.au that AICLA’s international division is continuing to enjoy strong growth, and the institute is close to finalising the program for its Asian claims convention in Bangkok in March. Estelle Pearson, Managing Director of actuarial and insurance consultancy Finity, has been named Actuary of the Year, recognised for making a key contribution to business, the community, government and the profession. She was chosen by a panel of senior Actuaries Institute members “for her leadership in the actuarial profession, positioning actuaries as providing exceptional service and strategic advice to the insurance industry”. Climate sceptics among us: Some Australian insurers remain sceptical about climate change, a new survey shows. Only 65% have adopted the formal position that climate change is a reality, according to a survey by actuary Evelyn Chow and actuarial analyst Jessica Egan. The participants represent 70% of all licensed general insurers in the country, and include 19 insurers, four reinsurers and three government insurers. Eight small insurers surveyed are most sceptical about climate change, with one taking the position that climate change is not real. Three others have not adopted a formal position but two of these are taking action on climate change regardless of their opinion. Of eight mid-sized companies surveyed, three do not have a formal stance and are taking no action, while two have not taken a formal position but are taking action. All three government insurers surveyed and all seven large insurers questioned believe climate change is happening and all are taking action. The Victorian Government is proposing fines of up to $500,000 for individuals and $10 million for companies that take advantage of consumers during the transition from the fire services levy (FSL) to a property-based tax next year. The state’s incoming FSL Monitor is former Australian Competition and Consumer Commission chairman Allan Fels. Legislation introduced to Parliament last week states an insurer is engaging in price exploitation “if it issues a regulated contract of insurance and the price for the insurance is unreasonably high, having regard to a number of factors including the fire services levy reform, the historical fire services levy rates charged by the insurance company and the costs of supplying insurance against fire”. New Zealand’s earthquake insurance model is systemically flawed when exposed to a large volume of claims, Vero NZ Chief Executive Gary Dransfield says. Calling for an overhaul of the system at a business function in Wellington, Dransfield said there is no consistency in the terms and conditions of policies being managed by both the Earthquake Commission (EQC) and private insurers. “Having a government insurer and private insurers responsible for claims from the same customer has made the Canterbury recovery extraordinarily complex and has reduced claims management speed and efficiency,” Dransfield said. He had earlier rejected EQC Chairman Michael Wintringham’s assertion that there is an incentive for insurers to reduce their liabilities by shifting costs onto the state. Individuals in workplaces are expected to make decisions based on their own and their companies’ needs, but their decisions are likely to be far more incisive if the decision-maker understands the big and small things that happen in the wider insurance world. It’s this belief that powers Insurance News. Being regarded as the standard source of industry news and information for people in insurance is a big responsibility, but also a personally and professionally rewarding one. In our December issue last year I reported that we were finishing 2011 with 17,800 subscribers for insuranceNEWS.com.au. Twelve months later our subscriber list has grown to around 20,500. At the end of November we had achieved 173,405 unique visitors making more than 527,000 visits and nearly 2.5 million pageviews for the year. This magazine now has around 8000 readers, making it the largest-circulation news publication in the industry. As a journalist trained in daily newspapers when they were exciting places to be, I still take particular satisfaction in “breaking” important news. Being first and being right are the things that drive journalists, and I’m proud of the fact that the Insurance News team is first and right far more often than anyone else – including the daily media, which often struggles to understand insurance beyond the financial performance of the top three insurers. We speak to more industry people than any other insurance publication or newspaper, and I believe we are trusted with important news because we care as much as the informants do about accuracy and relevance. 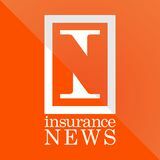 As anyone who joins the Insurance News editorial team quickly learns, insurance is neither boring nor irrelevant. Despite the undertones of distrust exhibited by our daily media and our politicians, the industry’s positive stories far outweigh the negative. To the leaders and managers who have entrusted us with their important information and their opinions; to our constantly growing legion of subscribers and online visitors; and to the advertisers and sponsors who make our publications possible, the Insurance News team joins me in wishing you a happy and fulfilling summer. market and “current conditions” are more likely to attract new entrants than at any time * during the past few years. “There is the risk that we start to see accelerated change over the next decade leading to more extreme, more costly events much more quickly than we have anticipated.” felt across the industry. “Weather has a dramatic impact on the Australian insurance industry. Relative to other countries we have a lot of weather,” she says, adding that our weather is also incredibly variable in type when compared globally. Ever-increasing amounts of data – about weather as well as a multitude of other risks – from within and outside the industry will all need sifting through and refining. Ms Pearson predicts the scope and influence of actuaries will continue to grow, extending to an increasing involvement in the claims end of the business, where their unique skills can be utilised to identify fraud patterns, address claims leakage and help to identify best in class claims practices. 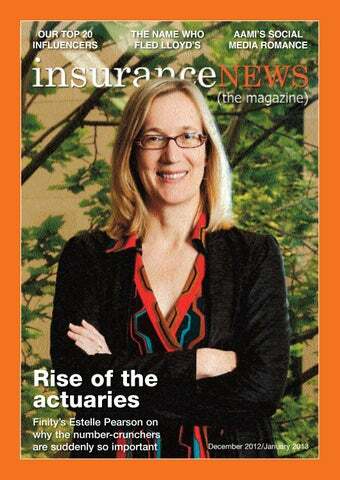 * In short, the rise of the actuary is far from over. dent and health cover through offices in Brisbane, Sydney and Melbourne, and Australis writing property, liability, construction, care and corporate business out of Sydney and Melbourne, the synergies between the two companies are obvious. Mr Lynam clearly sees big things ahead for the scaled-up Australian underwriting operation. “The group has market-leading expertise in developing MGA businesses, from OIM in the UK to RPS in the US, and, of course, Australis here in Australia,” he told Insurance News. “The new platform will allow us to continue to invest in our growth strategy, through increasing our depth and reach and enhancing our offering to clients.” Where they exist within the same company, broking and underwriting businesses are usually separately run and managed, but while never explicitly stated, the holy grail of tie-ups such as the Arthur J Gallagher-SRS deal is the ability to retain the insurance dollar end-to-end in a transaction, from commission to premium. Mr Lynam admits that with Arthur J Gallagher’s extensive retail and wholesale broking business in London, SRS’s new owners will probably “take advantage of utilising their London capabilities” to place the $75 million of annual SRS premium into the Lloyd’s and London markets. No doubt that will be to the detriment of Tysers, the major London placement broker that currently works with SRS. But such are the realities of the brave new world of insurance convergence, where managing conflicts of interest, rather than avoiding them, has become accepted practice for large in* dustry players. From established to toxic to redeemed: “Chartis” replaced the famous AIG brand after the US giant nearly collapsed in 2008, but President and Chief Executive Robert Benmosche wanted it returned after the debts were paid off. He describes the new AIG logo as “contemporary, dynamic, transparent and revitalised”. The Chartis brand will be replaced in Australia by mid-February. resigned – because we regarded the position she held as pivotal to the industry’s ability to communicate and influence. People from the industry associations haven’t otherwise featured in these lists. This year we’ve withdrawn Financial Services Council Chief Executive John Brogden – a three-year listee – because it’s obviously futile to keep pointing out that he has opinions and can communicate them well, is always available to the media, thinks strategically and is influential in industry, politically and in the community. But general insurance isn’t actually in his area of interest, and there’s only 20 positions. There’s a marked preference among our list committee for leaders who stand up and comment on insurance issues to the wider world. As one member pointed out, the “we’re a great industry because…” speeches are routinely rolled out at insurance events by executives who avoid discussing vital industry issues when they’re in a public forum. You don’t have to be a keen orator to make this list, but it helps. You can influence the direction of an entire industry by your actions and decisions. If you’re good at a job that has the potential to influence others, you can be a contender. You don’t have to agree with or even like some of the people on this list. Just accept that their job, their passion or their strategic ability puts them in a position to influence the way you do your job, the way the industry is regarded, or the way you and your peers work. We salute the 20 people who’ve made our list. They worked hard to get here. As the once-feared New South Wales right wing of the Labor Party implodes, Bill Shorten’s political star continues to ascend. His multiple roles in the stillvulnerable ALP government means his campaign to force the general insurance industry and the wider financial services sector into a more consumer-friendly shape is now being shared more among his Cabinet colleagues. But it was Shorten who did the hard yards after the 2011 Brisbane floods, setting up official inquiries and pushing the industry to accept a legislated standard definition of flood (which makes you wonder how he made it look so easy when the industry had tried and failed for so many years). Today around 80% of homes in Australia are covered against flood, compared with around 3% just six years ago, and that wouldn’t have happened so quickly without Shorten’s persuasive presence in the debate. His impact in the non-general insurance area of financial services has been equally profound, with his Future of Financial Advice (FOFA) reforms “giving consumers a greater voice and creating a greater financial services industry in the future”. General insurance brokers should be aware of the complex “best interests” provisions of the FOFA reforms, which also apply to them. Anyone who has dealt with Shorten tends to describe him as a good listener who will always try first to find a consensus solution. If he doesn’t he has an iron will as backup, as well as a willingness to force through unpopular policies (for some) like FOFA if they have perceived benefits for consumers. Well-connected and highly regarded for his burgeoning political skills, Shorten is a possible future prime minister. Our three previous lists of the influencers have always featured Mike Wilkins at position two or three – testament to the IAG chief’s ability to stay the course in a trying business. Brought in to bolster sharemarket confidence in IAG during 2007, he has gradually brought stability and a focus on cautious growth. Wilkins sits high in our esteem (he was the Insurance News cover subject for our June issue this year) for his willingness to get out into public forums to spruik insurance and provide perspective for issues that are little understood outside the industry, while most of his peers (with the notable exception of Suncorp’s Patrick Snowball) tend to keep their opinions to themselves. Wilkins is steadily building IAG’s presence in key Asian markets via joint ventures – he’s aiming at 10% of gross written premium coming from Asia by 2016 – and will probably sell off the loss-making UK arm he inherited once it’s worth something. At home the group buys strategic businesses when they make sense, like the acquisition of crippled New Zealand insurer AMI – but most local growth will come organically by investment in existing businesses. Wilkins remains the most willing of the industry’s chief executives to speak about controversial industry issues to non-industry audiences. We raised eyebrows last year when we described Robert Kelly as a “passionate, outspoken, muchadmired bulldozer”, but there’s no doubting his influence inside the industry, the strength of his opinions and his determination to always do his best for his legion of members and the wider industry. From the launch of the Steadfast cluster in 1996 to its public float in 2013, the history of Kelly and the organisation he co-founded (he was its first shareholder and company secretary) are intertwined, and his reputation has grown along with the organisation. A hard man to best in an argument, Kelly these days prefers to negotiate and convince rather than bulldoze. An excellent communicator and one of the best-known personalities in the local industry, it’s still tough getting between him and a good idea. His stewardship of ACORD in Australia is an illustration of that. The next year should prove a high point in a career of remarkable individual achievement. Mark Milliner President, Insurance Council of Australia, Chief Executive, Personal Insurance, Suncorp The new President of the Insurance Council of Australia (ICA) takes the reins from Rob Scott on January 1, and has already demonstrated several times through his career an innovative approach that just might be positive for the industry. The united claims and back-office operations at Suncorp, its “one company many brands” approach and the new developments in faster and more efficient vehicle repairs being rolled out by AAMI all bear the Milliner touch. His two-year term working with the ICA team will be interesting, particularly if Milliner decides the industry body could do with some sharpening up. APRA doesn’t have a role that stirs the senses, but you ignore it at your peril. For example, January 1 will signal the implementation of the three-year-old LAGIC reforms, which are intended to achieve greater consistency in general and life insurers’ capital frameworks. Laughlin is one of the trio who run APRA, and he deals extensively with insurance issues. A former financial services senior manager turned professional director, he is also APRA’s representative on the all-powerful executive committee of the International Association of Insurance Supervisors. From Solvency II to stress-testing and reinsurance counterparty risk reports, APRA is increasingly focused on not only how insurers are performing but also how they would perform in a range of scenarios. If overseas trends are anything to go by, Laughlin and his crew are likely to become even more demanding of the industry in the future. 8 Colin Fagen Chief Executive Australian Operations, QBE NIBA changed the rules to widen the vote, but brokers this year still voted overwhelmingly for QBE as Insurer of the Year – for the 11th consecutive time. Which means that Colin Fagen has kept things on an even keel for the 17 months he’s been running QBE’s Australian business, even as other parts of the empire falter. Growing the division in a competitive market is a challenge he will continue to grapple with, as will most of his industry peers. Patrick Snowball Group Chief Executive, Suncorp Snowball has made a number of speeches during the year that use his semi-outsider status as an Englishman in temporary residence to great advantage, politely pointing out things in the public arena that he believes need attention. His comment on the Federal Budget in May is typical, noting that it was “not that of a sophisticated, disciplined economy with a clear, long-term strategy and vision” but rather “the message of an economy that runs the risk of squandering a once in a generation opportunity to promote savings and long-term investment…” The former soldier heads up a diverse company that needs an occasional nudge rather than a firm hand on the tiller. He leaves that to his talented lieutenants, who steer while he provides navigational input. His profile as an experienced leader is good for Suncorp and the industry. We alarmed a lot of readers last year when John Neal’s predecessor Frank O’Halloran went from No 1 to nowhere on our Top 20 list. Our rationale was that the legendary O’Halloran was no longer actively engaged in the Australian market. Neal’s only high-profile appearances in Australia since assuming the top job in August have been when he takes the heat at investor briefings, but we figure he’ll climb out from under in the next year as QBE’s woes pass and he assumes a more varied local profile. The QBE brand carries plenty of persuasive power in Australia, and it will be interesting to see how – and if – Neal feels the need to use it. Rob Scott Managing Director, Wesfarmers Insurance The companies under Scott’s wing include two insurers, a retailer-based direct personal lines operation and a major national brokerage. Coming out of a twoyear stint at the Insurance Council where he revitalised the post-floods council and gave it more communications heft, Scott has plenty more to concentrate on as the market competition hots up – particularly for Lumley Insurance and the Coles Insurance project, which can’t keep undercutting the motor insurance market forever. Or can it? Not only is Allan Manning a tireless champion for industry causes (he was the cover subject in our August edition for that very reason), he’s also a successful businessman, an academic and a passionate blogger. Products from his LMI Group are available in a number of foreign markets, and he is regarded as the guru of Australian insurance policy wordings. On top of all that he maintains pressure on state governments over their insurance taxes, and he’s shared some victories to celebrate this year, among them the decision by New South Wales to follow Victoria into transferring its emergency services levy from insurers to property owners. Professor Manning says it as he sees it, which makes him an industry living treasure. It’s always hard to separate the relative influences of the people who run Swiss Re and its archrival Munich Re, although each company takes a different approach to the local market. There’s been enough for Senkevics to concentrate on over the past 18 months, and his enthusiasm for catastrophe risk products has placed the company in a persuasive position. Swiss Re is also big in Australian life and health wholesaling, including through the Hollard/Woolworths alliance and a Medibank tie-up, which gives Senkevics exposure across a range of markets. He’s also a director of the Insurance Council. Heinrich Eder Managing Director, Munich Reinsurance Australasia Munich Re has a big profile in the local market, and Heinrich Eder has been on the scene about seven years – long enough to appreciate the strengths and understand the weaknesses. The reinsurers are increasing premiums here and in New Zealand, but not so steeply that they’re impossible. These days Eder is the elder statesman of the reinsurance sector, and his seat on the Insurance Council board gives him added perspective. His underwriting arm Great Lakes is continuing to steadily take up opportunities in the local market, which peeves some insurers who think Munich should stick to its knitting. A veteran in the consumer field, Kell knows many of the leading players in the insurance industry, as well as the consumer-related issues. His job is to ensure the consumer gets a fair go, but his gritty determination to make change happen doesn’t mean he’s a firebreathing activist. His career has taken him into many high-profile roles locally and internationally, most notably as deputy chairman of the Australian Competition and Consumer Commission and chief executive of consumer advocacy group Choice. Kell has the power to name and shame and to highlight the industry’s consumer deficiencies, but he prefers persuasion to humiliation. While consumer causes are a hot topic at present – it always is when an ALP government is in power – the emphasis on consumer power would likely slip to the backburner if a conservative government wins the 2013 election. Richard Who? is no longer an acceptable response when the Enthoven name is mentioned in industry circles. The boss of giant South African family company Hollard has partnerships with 20 brokerages and 12 underwriting agencies, four insurance operations, the growing Real Insurance direct business, and the potentially huge Woolworths retail offering, which covers home, car, life, travel and pet insurance. Enthoven, an Australian citizen born in South Africa but educated in the United States, is a canny player who works quietly but very effectively. Expect more surprises. While broking organisations spend millions building their own electronic links to insurers, and insurers spend even more building unique links to brokers, Ebix is impossible to write out of the equation – as much as some wannabes wish they could. Its Sunrise Exchange transaction platform and dominance of the back-office systems used by brokers places Ebix, and therefore d’Apice, at the centre of things. New systems are being introduced from Ebix’s vast global resources as the need arises – a new life insurance offering is among the latest – keeping d’Apice and Ebix in front and as hard as ever to catch up to. Pacific Region Head and Chief Executive Australia, Marsh He hasn’t been heard from much this year, but the size and industry reach of Marsh in this part of the world means Clayton doesn’t have to sweat it in the limelight. Marsh is doing fine, according to his equally modest lieutenants. The company has a very diverse business strategy, and an 8% third-quarter rise in revenue to $468 million suggests Clayton is pulling all the right strings. Big companies – and Aon Australia is seriously big – tend to influence the industry around them in quite diverse ways. This year Steve Nevett drew a line in the sand to cool off a scramble for rare and expensive specialist brokers, in the process demonstrating Aon’s deep well of available talent. He’ll leave it to his smaller big broker rivals to compete. Experienced and approachable, Nevett is a tough operator who runs a big company with impressive ease. He’s retiring at the end of the year after a stellar career, but don’t be surprised if Towell pops up in some influential position, probably Allianz-linked, in the future. Doyle’s departure from Zurich in April after a little more than a year in the chief executive’s spot to join Dual International in London was unexpected and dramatic. Straight-talking and highly effective, he had barely set Zurich on a new tack before deciding to take up a “now or never” opportunity overseas. Nobody knows Austbrokers as well as Lach McKeough, who grew the company from the germ of an idea to a listed company with some of the most profitable brokerages in Australia under his wing. He will move into semiretirement at the end of the year, but expect to see him around for a while yet as an adviser, doing what he does best – wheeling and dealing. Chief Executive, Financial Services Council – #14 last year Brogden is still around, and he’s still as influential as ever in his role as the sector’s go-to man for ministers and the media. We’ve dropped him from our Top 20 list because it was getting embarrassing spruiking his effectiveness and comparing him with others. If you want general insurance to gain stature and recognition with the people who set the national agenda, he’s the model to follow. Niran Peiris Managing Directorelect, Allianz Australia Allianz is keeping Peiris tightly under wraps until he takes over on January 1. Insiders say he’s a focused, intelligent and inclusive leader, and Insurance News journalists have enjoyed their brief contacts with him over the past few years. We look forward to finding out how different his approach to the dynamic Allianz Australia business will be. Frank O’Halloran Chairman, Steadfast Who would have guessed that combining the business abilities of former QBE chief executive Frank O’Halloran with the drive of Steadfast’s Robert Kelly could ever happen? The appointment gives Steadfast the ultimate high-profile chairman as it moves toward its May listing. Expect amazing things in the next year as the industry’s best-known insurance manager helps the industry’s best-known broker float and develop Steadfast. His arrival at Austbrokers in January will come at a time when such developments as the impending Steadfast float will put pressure on the listed company’s seemingly permanent upward profit trajectory. Recruited by CGU from Zurich Financial Services UK in 2010 (he was chief marketing officer and head of channel marketing for Europe), his local role as General Manager Broker & Agent has given him plenty of exposure to the intermediated channel and its vicissitudes. Stepping into the top job earlier this year after the unexpected departure of Shane Doyle, Fogarty has put his own seal on the role, moving up from being the enforcer of the latest business transformation process to become the frontman. A good communicator with adroit people skills, his wide industry experience is helping him build internal and (importantly) market confidence in a company that has suffered from a few too many strategic turnarounds directed from outside the country. Climate change will not increase the frequency of hurricanes or cyclones, although there may be more of the intense ones. But the data is very inconclusive. technology and computer processing will also impact on future models, making them increasingly flexible and allowing insurers to better adapt the models to their own needs. They will also be increasingly transparent, giving users clearer access to the underlying peril information used in the model, such as the actual windfield of a cyclone. He says advances in mapping capabilities, such as Google Earth, will give users a better ability to visualise risks and perform more robust analysis of concentrations and accumulations, along with “what if ” analysis. For all the flak aimed at modellers in recent times, it must be remembered that theirs is not an exact science. While leaps forward in science and technology will also see the development of more robust models, some uncertainties will remain. “We’re dealing with complex natural phenomena,” Mr Lee says. “We’re trying our best to model it but they are models and as such there’s going to be uncertainty.” Perhaps criticisms are better levelled at those who failed to own the risk and confused probability with predicting the * future. the general population – and 64% work for a company which engages in some form of social media, although most saw it as being “below average”. “Initially, companies didn’t want to hear about it,” Ms Griffiths says. “They thought it was just a flash in the pan. “Now everyone has pretty much realised that it’s here to stay. I think marketing managers have a lot of work to do. “If you don’t have a social media presence you are at a distinct disadvantage, especially if your competitors are doing it, and doing it well.” Most insurers are now doing it, and some are even doing it well. A survey by Insurance News of 20 Australian insurance companies shows 90% use social media. Of those, more than half interact with customers through Twitter, Facebook and YouTube. All of IAG’s brands have a YouTube channel, but only CGU and the NRMA brands are on Twitter. CGU has perhaps the most robust of social media platforms, counting 700 Twitter followers, 500 Facebook “likes”, 67,000 YouTube views and 1211 followers on LinkedIn. “We had a Facebook post the other today that said, ‘Thankyou for doing all the stuff in the social media space, you are the only major insurer that does that’,” CGU Manager Digital Channels Rebekah Taka tells Insurance News. She says social media has given insurers the ability to engage customers in a way that was previously impossible. But being responsive is critical. CGU monitors its Facebook page 14 hours a day, seven days a week and aims to respond to all queries within four hours during the week and 24 hours on weekends. “We monitor everything pretty carefully,” Ms Taka says. At Suncorp, AAMI monitors social media more closely than most teenagers. Executive Marketing Manager Richard Riboni says AAMI employs three people full-time in the social media team, plus another 15 from the retail distribution team who are trained to respond to posts on AAMI’s Facebook page. “We see Facebook and Twitter as extensions of our customer service,” Mr Riboni says. “From day one it was always a customer service channel.” AAMI is a relative neophyte when it comes to social media, having only joined Facebook in September last year and the Twittersphere a few months later. But it’s catching up fast, and has tweeted at least twice a day since and has attracted 337 followers. Mr Riboni says AAMI is using Facebook and Twitter as platforms for two-way conversations and the numbers are starting to show. In October AAMI received 190 questions/complaints via Facebook and Twitter, a fraction of the total the company receives but a rising number nonetheless. Each question received a response within 48 minutes. “We are bit more constrained about what we can talk about on Facebook and many conversations are taken offline, but we respond to every question,” Mr Riboni says. Mr Williams asked the court for a warrant to search Mr Simpson’s home “and to seize gold and silver bullion that Mr Simpson is allegedly hiding from his creditors”. expert evidence on English law as to whether a debt to the Inland Revenue would be recognised as a provable debt in the English bankruptcy. He was told it would not be. In November 2010, Justice Heath declared that all property seized in the searches, together with bullion surrendered voluntarily by Mr Simpson, had vested in Mr Williams. The judge authorised the property to be sold and the foreign currency to be converted, with all the proceeds to be held in a trust account. At another hearing two weeks later, counsel for Mr Simpson and Mr Williams advised that settlement was underway and Mr Simpson had acknowledged that money held in JW Smith’s bank accounts and more than $NZ500,000 in a New Zealand bank account belonged to him. Justice Heath noted the Commissioner of Inland Revenue had been brought into the discussions and Mr Williams recognised he could admit a foreign revenue claim in the English bankruptcy. In February 2011 Justice Heath said assets worth $NZ3 million had been realised, comprising $NZ2.27 million of bullion sold to the Perth Mint, foreign currency, shares, cash and interest earned. He noted Mr Williams had realised the funds in the JW Smith UK account. The original debt was £163,078 in 1998. In 2011, Mr Williams provided a schedule showing outstanding costs and claims of £1.25 million. In thanking the parties, Justice Heath said detailed research had been done on difficult questions of law that had not previously arisen in New Zealand under the cross-border insolvency regime. He said Mr Simpson had applied to the English court to annul his bankruptcy and it was likely there would be a surplus available to him following settlement of his debts. The matter did not end there, however. Justice Heath asked the police to investigate whether there was evidence Mr Simpson had committed perjury over evidence given about ownership of bullion found in the house and his denial of using JW Smith as an alias. Earlier this month Hamilton police said they had decided not to bring perjury charges and that Mr Simpson had moved to Auckland. New Zealand media reports say he has now * moved back to the UK. In a judgement of more than 700 pages, Justice Walmsley says the two fires were started by lightning strikes. Fire authorities managed to extinguish one fire but by the time they tried to put out the second one, known as the Mt Hall fire, it was too fierce. The court heard the Mt Hall fire started in remote, rugged and inaccessible country and the fire service did as much as it could on Christmas Eve to deal with it. Justice Walmsley says a vital part of the property owners’ case was that the authorities should have put ground crews in to fight the fire on December 24. But the evidence is overwhelmingly against them as the track was unsuitable. companies, and not at the expense of the public”. Dr Eburn, Senior Fellow at the ANU College of Law, does not believe fire authorities these days will be relying on the Blue Mountains bushfires decision regarding warning property owners, because technology has changed so much since the case began in 2001. The NSW property owners argued the authorities should have warned them the fire was coming, but in 2001 the fire service would have held a press conference, hoped the media turned up and then reported a particular fire among others that were burning. The court notes that on Christmas Day the Blue Mountains local radio station played music all day and says the fire authorities did what they could to warn people. Dr Eburn says these days emergency services have arrangements with local radio stations to broadcast emergency messages and are also using text messaging, social networking and a much wider range of media to send out warnings. In 2001 there was no Emergency Alert, no Facebook and no Twitter. “The world is not the same place,” he says. needs for it. The Blue Mountains experienced a very dry spell throughout 2001 and in December there were heavy winds and on most days a very high fire danger. Between December 24 and January 23 2002 there were 454 fires in NSW, and on the morning of Christmas Eve, 24 fires had been reported to the Rural Fire Service. The property owners said aircraft were available to fight the fire, but the NPWS and the catchment authority said there was a shortage of aircraft that day and those that were available were better used on other fires, which were of more immediate danger to lives and property. Justice Walmsley accepted the authorities’ argument that bushfires are a natural force that cannot always be coped with “and are often not coped with until they have run or substantially run their natural course”. There was no evidence to show anything the authorities did made the fires worse or aggravated the damage to the property owners, so it must be doubted that any duty of care arose. He says the argument for imposing a duty of care on fire brigades would result in fire officers who have to make split-second decisions having to consider whether their employer will be held liable for negligence. The judge found morale in an organisation such as a volunteer fire service should be considered in such instances, noting the Rural Fire Service in 2001 had 70,000 volunteers. Witnesses called by the authorities “did their honest and diligent best to perform their duties in fighting the Mount Hall fire in what I conclude were exceptional and trying circumstances”. Some of the witnesses agreed it would have been desirable to have given the residents earlier notice, but the failure to do so “is not of itself evidence of bad faith”, according to Justice Walmsley. He says the authorities had no obligation to issue warnings and even if these had been given, almost none of the property owners could prove they would have heard them. They also did not establish they could have taken any steps to reduce their losses. The 89-day trial was described as a “voyage of discovery” for the property owners, and Justice Walmsley concluded there was never a realistic possibility that the Mount Hall fire could have been * fought successfully on Christmas Eve. of occurrence], such as occurred in some Queensland catchments in 2011, would be expected to cause $4.3 billion in direct damages and an estimated $8 billion in total tangible damages. “It would flood 14,000 homes above floor level and destroy 6500 homes. At risk would be 43,000 residents and 9000 employees of local businesses. The extension would cost about $500 million and provide “significant flood mitigation” to the region. But an increase in the dam’s height would not occur without criticism from experts who spoke to Insurance News in 2011. Mark Babister, a Sydney-based hydrologist who backed the actions of the operators of the Wivenhoe Dam during the Brisbane floods, told Insurance News that the Warragamba Dam “can only mitigate floods to a limited extent”. The dam wall’s height was raised in 1990, and Mr Babister believes the spillway added at that time would discharge water downstream “at a pretty high rate”. That was a view shared by another hydrology expert, who declined to be named in the Insurance News article. He said the dam could pose a similar complication in a Hawkesbury-Nepean flood as the Wivenhoe Dam did in the Brisbane floods. The Infrastructure NSW report also finds a lack of “clear governance” inhibits effective flood management in the state and calls for the creation of a single entity to manage the state’s flood risks. At present responsibility for flood management is spread across a number of government agencies and local councils. “The lack of clear accountability creates the risk of inadequate risk management, and the dispersion of responsibility to councils without adequate overarching governance creates the risk of sub-optimal flood management,” Infrastructure NSW says. It notes that the lack of clear authority “has the potential to cause excessively stringent planning development controls as well as insufficient management of major risks”. Infrastructure NSW concludes that the Government should “immediately conduct a review of current responsibilities with a view to ensuring a single entity has clear accountability for flood management within the State * Government”. across the industry. NTI also assisted the sector in developing TruckSafe Accreditation specifically for heavy recovery vehicle operators, covering management, maintenance, workplace safety, driver health and driver training. “We also came to an agreement with recovery operators about standard rates, and there would be no more cowboys,” Mr Clark says. FACED WITH A CHOICE OF MANY TYPES and levels of business insurance, tradespeople can sometimes find themselves shrugging off the whole confusing thing and ending up underinsured. So CGU has created Trade Pack, a package tailored specifically for tradespeople. It covers public liability for personal injury or property damage, as well as product liability for up to $100,000 for damage or loss of goods in the insured’s care. The general property cover includes tools and professional equipment and can be extended to include theft in the open air, theft without forcible entry, worldwide cover and accidental damage resulting from a vehicle accident. And then there’s the cost of a tax audit. The Australian Taxation Office conducted 340,000 business audits last year. CGU says Trade Pack tax investigation cover covers the costs incurred by an accountant or registered tax agent in conducting an audit in relation to tax liability. “Whether it is cover for a carpenter, plumber or an electrician, Trade Pack is a straightforward choice,” says CGU’s Head of Sales and Distribution Andrew Beer. The insurer also offers extra options. “If tradies require additional cover for their work vehicles, workers’ compensation or personal accident, we have the products and the expertise to give them complete cover,” Mr Beer told Insurance News. Brokers can quote and bind through the CGU Connect platform. Trade Pack is now available nationally and all Sunrise-enabled * intermediaries have access to the product. It really could happen: If it does, you’d better have ticked ‘management liability for SMEs’ in the Vero bizpak BROKERS SAY ONE OF THE GREATEST frustrations they regularly face is the client who waves aside recommended cover with the glib assurance that “it won’t happen to me”. They don’t stop to think the broker wouldn’t have mentioned it if they didn’t think the risk should be covered via insurance. A survey by Cameron Research has found that only 17% of businesses protect their owners and directors with appropriate insurance such as management liability or directors’ and officers’ cover. The researchers questioned the owners of 700 SME businesses in April. Like the broker whose advice is ignored, Vero wouldn’t have bothered developing a management liability product for SMEs in its business pack if they didn’t think it was needed. But the insurer knows that in an increasingly litigious world, it really might “happen to you”. Vero has added management liability as a selectable cover in its business pack, targeted at SMEs. Management liability was previously available on a stand-alone basis only. Any claim against a company or its managers based on alleged wrongdoing could trigger coverage. Common reasons for lawsuits against business owners include unfair dismissal, sexual harassment, workplace bullying and OH&S breaches. “SMEs are especially vulnerable to the cost involved in defending themselves and could go under as a result, even in the event of a positive finding,” Suncorp Executive Manager Commercial Portfolio Chris Stallard says. The coverage is broader than legal defence costs and includes representation expenses involving the costs of attending and being represented at an investigation by an official body such as a regulator. It also includes amounts determined by judgement and award of costs or damages including compensation orders, settlements and insurable fines and penalties. There is also optional cover for financial loss arising from employee dishonesty, including theft and fraud. The Vero policy includes $25,000 cover for consultancy fees in a crisis, including a product recall, death of the managing director or loss of a major cus* tomer. reduced over the next 12-18 months so there is an opportunity for an additional player.” The market is crowded in terms of SME business, which is why SUA is concentrating on the hard-to-place corporate end, Mr Nilsen says. Lloyd’s is backing the new product. “It’s a very well known brand and a very secure option. It’s rapidly growing in the Australian market so we want to be part of that.” The agency is focusing on service and offering a quote turnaround time of 24-48 hours. It can also offer tailored policy wordings and conditions. SUA has also bought construction industry niche underwriter iConstruct, which was owned by the late online insurance innovator Guy Stening. It provides material damage and liability policies online to the SME construction industry with capacity from Liberty. iConstruct has retained its brand and staff, and Mr Nilsen says the iConstruct acquisition allows the company to enter a new * market. data and damage caused by unauthorised access to a system, and defence costs related to civil or criminal claims. Other features include cover for the costs associated with a data administrative investigation, and any penalties imposed following a breach of data protection laws or regulations. Mr Pollard says 85% of Australians say they would stop dealing with an organisation if their data was compromised, but only 54% of Australian organisations have the in-house capability to prevent and detect cyber crime. A study commissioned by Symantec put the cost of cyber crime to Australians at $4.5 billion a year, “so [companies] need to recognise that intentional or unintentional cyber breach can have serious financial, operational, legal and reputational consequences”. He says the current online environment, which includes social media, mobile devices and cloud computing, requires a more sophisticated approach to cyber risk by senior managers and directors. Matthew Clarke, Professional Indemnity Manager for Australasia, says Chartis developed CyberEdge “to fill the gaps in the current market and deliver a product that provides genuine peace of mind to Australian * organisations”. Ace goes for a dip Teamwork, focus and determination are the keys to becoming a champion swimmer, as well as a top business operative. That was the message from double Olympic gold medallist Kieren Perkins at an Ace leadership forum in Brisbane in October. About 80 brokers, risk managers and executives at the Brisbane Club heard Mr Perkins recall his swimming career and explain how he translated that success into the boardroom as a NAB executive. Another forum was held at Incontro restaurant in Perth, where former WA premier Richard Court discussed the economy, industrial relations reforms and business skills for emerging leaders. He spoke about the shift in Australiaâ&#x20AC;&#x2122;s key trading partners from the US, UK and Europe to high-growth economies such as China, Indonesia and South Korea. Having a flutter with CGU As the only Melbourne-based insurer, CGU sees the week-long Spring Racing Carnival as a great opportunity to mingle with clients from as far afield as Queensland, Western Australia and New South Wales. This year it hosted 85 guests in a marquee with a 200-degree view of the racetrack and an “Arabian nights” theme, with curtains and rose bowls to decorate, and a mouth-watering Middle Eastern menu. The theme even had a historical basis. Some 95% of modern thoroughbred racehorses are descended from three Arabian stallions brought to Britain in the 17th century. Tips were on hand from a professional and a “mug” punter. Winners of the fashions on the field competition for ladies and gentlemen took home a gala hamper. For all the fascinators and fedoras, the events were mainly a relaxed chance for industry people to mingle with some great champagne, good racing and plenty of laughs. Austbrokers gives hearty thanks Austbrokers held a â&#x20AC;&#x153;thank youâ&#x20AC;? night for members and key business partners during a special invitation event at the National Insurance Brokers Association Convention on the Gold Coast. The 110 guests included Austbrokers network brokers as well as general managers and senior representatives of the five major insurers. General Manager Acquisitions Fabian Pasquini welcomed the guests, who had plenty of opportunities to relax and mingle during the evening at the Envy Hotel. Austbrokers always uses such events to raise money for a charity that has some personal connection to someone in the Austbrokers network. This year the funds raised from collections on the night and a corporate donation went to HeartKids. Women in insurance get together More than 450 women – and quite a few suits – attended the Association for Women in Insurance annual general meeting. The 26-year-old New South Wales networking group hosted insurers, lawyers, loss adjusters and recruiters at Dockside, Darling Harbour, in October. The event’s keynote speaker, former senator Helen Coonan, discussed social media and the Alan Jones saga, plus the best ways to protect a company’s image and reputation online. There was some committee reshuffling, with Anna Moule from QBE 386 taking the role of Vice President, Sherrie Morton of Liberty International Underwriters becoming Treasurer and Hannah Rose of Lander & Rogers Lawyers elected to the committee. You may have heard of speed networking before, but this puts a whole new spin on the idea. Fun and business collided at the Allianz-BMW driver training day at Eastern Creek in Sydney. Although there was no shortage of volunteers, just seven members of the Allianz team hosted 15 lucky clients. With a focus on safety, they learnt defensive driving skills off and on the track. The day started with a theory session and an exercise in seating and steering, before the drivers tested their skills in late-model BMWs including the 123d, 328i and the M3. They faced challenging conditions in a controlled environment, manoeuvring the cars on water, oil and skid pads and around traffic cones. Guests tested the acceleration, braking and handling of cars and practised oversteering, understeering and correcting their mistakes. To finish the day, professional drivers including Geoff Brabham performed hot laps, taking guests in the passenger seat for a spin at top speed. Joe sent me… to the AILA Young Professionals night The Roaring ’20s were back in style at the Australian Insurance Law Association’s latest young professional networking night, Speakeasy at the GPO. A record 650 guests filled the lower ground floor at Sydney’s GPO. Plenty of lawyers, insurers, brokers, loss adjusters and forensic accountants dressed up and got into the swing of the 1920s theme. Gentlemen on the organising committee even wore white tails. Tarot card readings, cartoonists and a DJ were very popular, while a photo booth made for some great snaps. During the prohibition era in the US, illegal “speakeasies” were the only place to get a drink, although it’s unlikely they were as well catered for as the 2012 version, where the drinks flowed freely and people snacked on sushi, oysters and pizza. The next AILA YP event will be held in March and there are whispers it might be a gambling night. This one was sold out a week in advance so expect a rush for tickets. ‘Southerners’ head north and have a ball Organisers of the first North Queensland Insurance Charity Benefit were delighted to welcome some guests from “down south”… Brisbane, that is. More than 200 brokers, insurers and assessors enjoyed live music, auctions and a raffle at the Rydges Southbank in Townsville. Guests bid on lots including a framed, autographed Wallabies jersey and a pair of rugby boots signed by North Queensland Cowboys player Matthew Bowen. The ball raised $20,000 for Beyond Blue and Cancer Council Queensland. “It’s well over and above what we had anticipated raising,” event co-organiser Adriano Bellocchi said. Photo booth hire company In The Booth donated its services, which were a big hit with guests, and there were speeches from gold sponsors NTI and UAA. Premium Funding and Cerno were bronze sponsors. Organisers say they are already planning a bigger and better event for next year. Lumley sets the benchmark high Driver safety was the order of the day at the 18th annual Lumley Insurance Benchmark awards in Melbourne in October. More than 100 motor fleet and property professionals attended the lunch and presentation at MaiĂ in the Docklands precinct. The guest MC was V8 Supercars champion Garth Tander, who spoke about his path to professional racing and the challenges he faced as a young driver living away from home. Murcotts Driving Excellence General Manager Operations Mark Kelly showed the crowd videos from a new computer-based driver education program that has been developed with Lumley. Toll Contract Logistics and its broker Aon won the Heavy Motor award. Lumley says a focus on managing driver safety and controlling fleet costs benefits both employees and the companies they work for. The inaugural Corporate Solutions â&#x20AC;&#x201C; Property award was presented to timber company AKD Softwoods and its broker OAMPS. The prize is awarded to the company that displays the best use of risk management at the forefront of all its processes, dangerous goods handling and storage practices. Zurich, ladies, Geelong, gee-gees Ladies’ day at the Geelong Cup has become a Zurich tradition, now in its sixth year. The exclusive women-only event is also now one of the company’s most popular functions. The insurer found there was a need to entertain women in the industry who don’t always want to watch soccer or cricket, but who enjoy doing lunch and getting dressed up. The day began with the company’s males serving a champagne breakfast in the Zurich boardroom in Melbourne before the coach trip to Geelong Racing Club. The 60 brokers and Zurich staff in the Roseview marquee had a great view of the racetrack and managed to pick a lot of winners throughout the day. Because all the ladies look so lovely, it’s too hard to choose the best dressed. Instead, there’s a random prize draw – for women’s shoe vouchers. Insurance Advisernet soaks up the sun Delegates from Australia and New Zealand enjoyed a trip to sunny Hamilton Island for this year’s Insurance Advisernet conference. More than 400 staff, insurers and industry partners attended. Because the group sponsors a Kokoda Track walk with the Returned and Services League each year, one conference session included talks from an Afghanistan veteran and the father of a fallen soldier. They discussed their experiences of war and their time on the commemorative Kokoda trek. Later, authorised representatives raised $50,000 in six hours for next year’s walk, enabling eight returned soldiers and parents of the fallen to walk the track in PNG. “We’re pretty proud of it, I must say,” Insurance Advisernet Managing Director Adrian Kitchin said. A charity golf tournament on nearby Dent Island raised more money, this time for children’s charities Variety and KidsXpress. When delegates were not learning, there was time for swimming, mingling at sponsors’ nights and enjoying the sunshine. The group also presented awards to exceptional practices in Australia and New Zealand. Criteria included continued growth, community participation and contribution to Insurance Advisernet’s professional standing. CeeJaze Management & Consulting was named Insurance Advisernet Australia (IAA) Authorised Representative of the Year. Principal Craig Fretwell accepted on behalf of the practice. The Insurance Advisernet New Zealand (IANZ) Broker of the Year prize went to Meridian General Brokers, with Principal Bernie Kane accepting. “It was very hard to split this year,” Mr Kitchin said. “There were some outstanding performances.” The Chairman’s Award went to IAA director and Insurance Advisernet UK Managing Director Fred Allsopp. Employee of the Year was IAA help desk consultant Carissa Mitchell. The IAA has 137 corporate authorised representative practices employing more than 350 advisers, while IANZ has 28 broking practices with more than 70 advisers. In the 12 months to June income grew 18% for the IAA and 35% for IANZ. The group attributes this to a recruitment program targeting entrepreneurial, young professional brokers and a focus on in-house training. Expo attendance delights UAC The Underwriting Agencies Council (UAC) was thrilled with the turnout at its South Australian Underwriting Expo, held jointly with the National Insurance Brokers Association (NIBA). Some 200 brokers, mostly from South Australia and the border regions of Western Australia and Victoria, attended the event at the Sanctuary in Adelaide Zoo. Fifty-two UAC members exhibited, up from 35 last year and a record for the Adelaide expo. UAC and its strategic partner Vero presented a $2500 cheque to the Royal Flying Doctor Serviceâ&#x20AC;&#x2122;s General Manager Public Relations and Marketing Charlie Patterson. It is the second year UAC has supported the charity. UAC Chairman John Iles and NIBA Chief Executive Dallas Booth welcomed and thanked guests. Lucy learned early that people eating at the lunchroom table are suckers for the right begging approach. However, apart from the tendency for a begging dog to be annoying, dogs don’t need a great variety of food. Lunchtime loot sometimes results in an unexpected afternoon poop, so the “don’t feed Lucy” rule is strictly observed. Staff also have to be aware that Lucy sleeps much of the day in sunny spots, under desks and around her favourite people, so she can be a tripping hazard. She leaves her toys – an old ugg boot, a hand puppet, a length of rope and a stuffed toy owl she routinely disembowels and scatters – wherever she has lost interest in them. She likes to empty handbags left on the floor under desks (sorry Jan!) and is an efficient but indiscriminate paper-shredder. Despite her less sociable traits, it’s impossible to stay stressed about something when Lucy strolls in for a visit, which may involve her curling up for a kip next to your feet (as she is right now) or a nuzzle and a bit of a pat or even – if you’re lucky – a full-bore cuddle. She attends all news meetings, where she sits on the floor and mercifully keeps her opinions to herself, although she has been known to utter an irritated growl from under the table when a certain politician’s name is mentioned. Perhaps I imagined that last bit. But you’ll eventually find yourself valuing their opinions if you keep a pooch or * two around the place.